How Germany's Green Party Keeps Winning Formed in 1980, the Greens are now the second most popular party in the country. Much of their success, analysts say, has to do with the worsening image of the country's traditional leading parties. 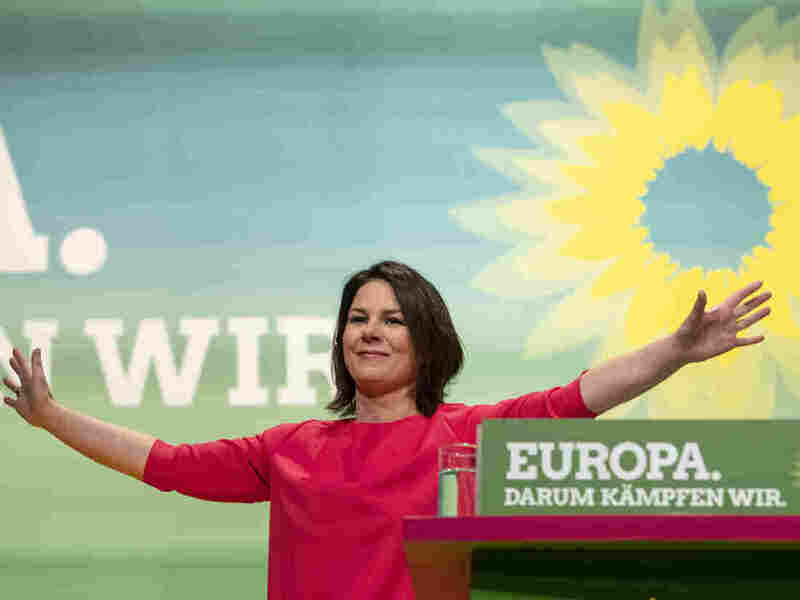 Annalena Baerbock, co-chairwoman of the Green party, gestures during her speech at the party convention in Leipzig, Germany, in November. German politics is going through a major transformation. For most of the postwar period, two giants have dominated — the center-right Christian Democrats, CDU, and the center-left Social Democrats, SPD. Now the two big parties, which form the current coalition government, are in trouble. Their support has sunk. Yet, while one upstart far-right party has taken much of the blame, another group from the left has been quietly charging up the polls: the Greens. Germany's recent state elections in Bavaria and Hesse revealed a surge in support for the Greens. In national polls, they are ranked second, chasing the Christian Democrats and well ahead of the Social Democrats. The Greens have seats in 14 of Germany's 16 state legislatures — and in nine of those they form part of a governing coalition. The Greens were founded mainly as an environmental and peace activist party in 1980, and were in the in the national parliament, the Bundestag, three years later. From 1998 to 2005, they were the coalition partner of the Social Democrats in the government of Chancellor Gerhard Schröder. The emergence of the Greens as a political party seeking power was a shock to the stable and predictable world of German politics in the 1980s. "The Greens wanted to turn Germany upside down," says Werner Weidenfeld, a political scientist at the University of Munich. "It was like a great awakening, a radical, almost spiritual initiative. Their mission: To enforce environmental protection with a certain aggression." That radical message appealed to only a small portion of German voters. The Greens soon found themselves enmeshed in years of internal fighting between warring radical and pragmatic factions within the party. 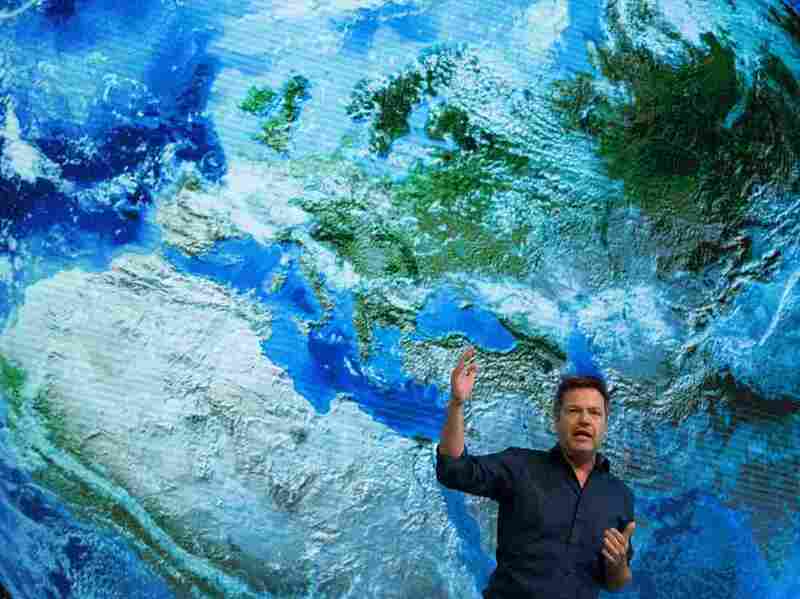 Co-leader of the German Green party Robert Habeck speaks on stage during the party's congress in Leipzig, Germany, on Nov. 11. Eventually, the Green party moved away from its initial radicalism. "The shift was not the effect of an official resolution, but the consequence of different mood changes over a period of many years," Weidenfeld explains. Whatever the process, the strategy worked, and now the Greens "have fully adapted to the rules of the political system," according to Jürgen Falter, political scientist at Johannes Gutenberg University in Mainz. "Undoubtedly, the greatest achievement of the Greens is the fact that they are seen and accepted as equal partners on levels of the political system," Falter says. "They have proven their government suitability, their ability to run a state government and represent a federal state." Outside observers might struggle to find an obvious reason for the unpopularity of the mainstream parties. Germany is wealthy, safe and secure. It is Europe's leading economy, recently honored as a global leader in innovation. And the governing coalition has made some progress, in areas ranging from migration to childcare to retirement. But there is a problem: Voters apparently aren't noticing. What they see is the parties' disagreements and anxieties, especially over contentious issues like immigration, which has divided Germans. The Christian Democrats, the party of German Chancellor Angela Merkel, and the Social Democrats have been in coalition for 11 or the last 15 years, and the strains are beginning to show. Spats between the coalition's parties, and within them, have benefited some of those not involved — particularly the Greens. "The current success of the Greens results from the weakness of the so-called traditional parties on the one hand, and the decisive and unified appearance of the Greens on the other," says Falter. The Greens are good at hiding their internal disagreements, he says, and instead transmit a feeling of unity, positivity and friendliness. It's not as though the Greens are problem-free. "The biggest weakness of the Greens is the split into eco-socialists, eco-liberals and eco-conservatives. You never know who will dominate and prevail — the system changers or the environmental rescuers," Falter says. Another common criticism of the Greens is a perceived certitude in the way they legislate. Moreover, they are criticized as relying on tools like enforcing prohibitions — say, a ban on diesel or meat — instead of incentives as a means of achieving their political goals. "What is missing is stringent and coherent security policy concept," Weidenfeld adds. What do the Greens stand for? Psychologist and media scientist Jo Groebel sees another reason for the growing Green popularity: "They combine the ideas of ethically responsible politics on the one hand, with the promotion of material well-being of the citizens on the other." What's more, he says, the Greens have policies that match worries of a lot of German voters. "It is true for environmental issues, it is true for their fear of war and their concerns about increasing armament in the world," Groebel says. According to Groebel, the Greens now represent "the German desire for harmonious and economically sound everyday life with a morally 'superior' approach to politics." Weidenfeld, the University of Munich professor, finds it ironic that a party that used to be a symbol of radical change has now come to represent stability. "The Greens do not really fundamentally change the political course of Germany anymore, they much rather stabilize it," he says. "For example: When the other parties started questioning European integration, it was the Greens who declared themselves in favor of a strong Europe in all clarity." The Greens themselves know they have to overcome a number of challenges to keep growing their success. "We have to win back confidence in our liberal democracy and its institutions. That is our new role now," says one of the party's co-leaders, Robert Habeck. "People are longing for serious and constructive policies which go beyond the screaming and shouting." Habeck insists the Green Party is offering German voters a real alternative after years of coalition government. "We need to address the pressing problems with real answers – without always watering them down in advance. Determined on the substance, pragmatic on the implementation. That is what it now comes down to." Time will tell if the Greens can keep up the momentum. Some analysts are skeptical it will last. "Many of the current supporters of the Greens," says Falter, "are not their core and loyal voters, but have joined the Greens, among other reasons, out of anger against their original parties." Weidenfeld predicts that if support for the far-right Alternative for Germany party weakens, "the traditional parties would revitalize, they would become stronger again. Accordingly, there will be less disappointed voters who turn from the traditional parties to the Greens."